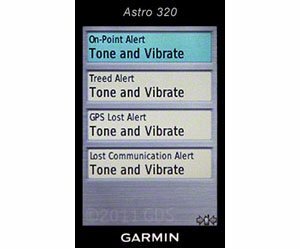 Steve's Garmin Astro 320 REVIEW by Steve Snell. Since the introduction of the Garmin Astro in 2007, we have had 3 different versions of the dog collar, but this is the first major change that we've had in the physical handheld. New battery cap features the Garmin "backbone" design. Backwards Compatible all DC 20, 30, and 40 collars. Dog Trails: Choose from three views: Complete History, Partial History, or no Trail History. Zoom to MAP DOGS - automatically have all dog appear on our map screen -- no matter how far they are from you. Dog Alerts - tone only, vibration only or Tone and Vibration. 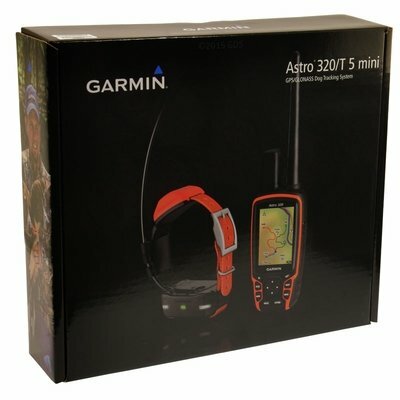 The Astro 320 features a body type based on the Garmin 62ST, where the original 220 was based on the Garmin 60. The 320 will be a similar size and shape for Astro users. It has a fully rubberized outer coating with an over molding, making it a little easier to grip. The non rubber exterior is trimmed in orange in place of green on the original, which is nice in a hunting environment. It's also going to stand out a little bit better if you set it down somewhere or drop it in the grass. Along with the over molding is an improvement in the rubber around the RF antenna. One of the problems with the 220 was that changing antennas on a regular basis would tear the rubber around the antenna. This fixes that issue. The power button on the 320 is located on the right side of the handheld. I like this change since it is a more convenient location. 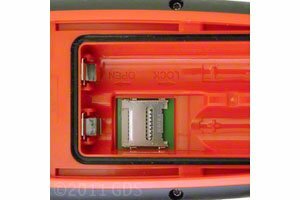 The power button on the original 220 is in between the GPS antenna and the radio frequency antenna. It's a clumsy, hard to reach position. The keypad design on the 320 has the exact same button set up as the original 220, but the buttons are raised slightly higher and they're square instead or rounded. The overall keypad is a little bit bigger, especially the arrow keys. Several of the lower buttons are also larger. This should help make the unit a little easier to operate when you are wearing gloves. One of my favorite changes is the new location of the lanyard attachment. On the Astro 220, the lanyard attachment is on the left side toward the top. No matter how you wear it, the handheld faces away from you. When you grab it, you have to turn the unit back in the right direction to see the screen. The 320 lanyard attachment location is at the bottom of the unit. You are able to strap in and hold the unit facing down on your body. This way I can just pick it up and look at it with out having to turn it. When I am finished, I can let go of it and it goes right back into position. The Lanyard attachment is also much wider than the original. This will open up some options on new attachments that will make the unit easier to carry and more secure. Along with the new lanyard changes, the battery cap on the back of the 320 features the Garmin "backbone" design. It's designed to work with certain Garmin accessories that snap onto it. This will also open up a bunch of new ways to carry your handheld. The biggest difference between the Astro 220 and 320 is the maps. The Astro base map has changed drastically. The Astro 320 features the Worldwide DEM basemap. It has more shading, more roads, and more waterways. Now, don't take that to mean that it's a topo map, because it's not. It's just more detailed than the base map we've had before. It's a little easier on the eyes, too, as far as when you're looking at it. I just like the color combination a little bit better. Plus, the Garmin Astro 320 gives you the ability to customize the dog map to fit your specific needs for better dog tracking. Probably my biggest complaint with the Astro 220 is how you view your dogs on the map. Garmin designed the original product with the use of two dog screens. You have the Compass View which tells you the direction and distance the dog is from you, and you have the Map Screen which allows you to see where the dog is and his tracks. On the map screen you can see where he has been and how he is covering the ground. From the Map Screen it is difficult to tell how far away your dogs are from you, and you have to watch for an update or two to have an idea exactly what direction they are moving in. The other problem with the Map Screen is that the dog trail history is on the screen as well as the trail of your own track. The screen can quickly turn into what I like to call a really messy finger painting. Add multiple dogs to the mix and the next thing you know, you've got four trails crossing over each other over and over. It doesn't take long for the screen to get so crowded, that you can't tell what's going on. The advantages of the dog history can become a liability in these situations. I have been known to clear out a hunt and start over in the middle of running dogs just so I can start with a fresh screen. Garmin has addressed all these issues in several different ways. My favorite part is that you can change the Map settings on the fly from the handheld with a quick push of a button. or no history at all. When you start running in the Map Screen, the Astro 320 will show the complete dog trail history. At the point you want to go to partial history, simply press the MAP button once. The dog's trail now only shows the last 5 minutes of history. Press the MAP button once again and the dog's entire history will disappear. Press the MAP button once more and the complete history returns. This gives us the best of all possible situations. The advantage of this new feature is that you have ALL the history all the time if you want it, but you can control the amount that you see at any time. You can also completely blank the screen if it's in the way. I could not be happier with this particular new idea. It's much better than anything I have suggested or I have heard from other users. It's even better than Garmin told me it was going to be. A big advantage of this new feature is that more users can store the entire day's tracks in their unit without having to clear them out at the end of every round. Since you can get them off the screen at any point, you will be able to keep up with the entire day better and have a much better understanding of how your dogs are hunting. The other cool thing about the partial history is that you control the length of time of the partial history. You can select between 5 minutes, 10 minutes, 30 minutes, 1 hour or 2 hours. I expect the 5 or 10 minute option is going to fit most folks really well, but we will have to see on that one. It's easy to change in the field so you can experiment with it and find the right set up that fits your needs. The Map Screen gives you a number of Icon Options. The Astro 220 Map would show an image of the dog that would indicate the dog's status. If the dog were running it would be a running dog. If "on point" the image would show a pointing dog. If "treed" then the image was of a hound on a tree. If sitting, we had a picture of a dog sitting. You would also have the name of the dog. The new 320 Map gives us some choices on what we see and when we see it. From the Map Screen, press the MENU key. This opens up several Map options. The ones that control Map icons allow you to pick between Dog Status, Dog Distance, Dog Names and Offscreen Dogs. -- Using this feature, you can remove the dog status Icon and replace it with a triangle that is pointed in the direction that the dog is moving. Replacing the Dog Status image with the colored triangle does not eliminate the point or treed alarm and it does not change the icon image on the Compass screen. -- One of the things I hated the most about the 220 Map screen was the issue that you could not easily tell the distance of the dog from you while looking at the map. With this new option, you can include the dog's actual distance from you on the screen. You can see him, his trail and his distance all at once. -- This next space saving option is the choice of showing the dogs name on the Map screen. With the 220 it was always there, but with the new software, you can remove it with one click. This also really cleans things up and makes it easier to see the color coded dogs. Names will still appear on the Compass screen. -- This might be my favorite of the bunch. The biggest problem with the 220 map was that once a dog got a long way out, he would go off the screen. To find him on the map, you would have to use the page out button and you would have to press it over and over again until you found him. The new Map has the option of showing "off screen" dogs. When you activate this option, once a dog leaves the map screen you are on, a small tab appears that shows where the dog is in relation to your MAP screen. As you move the MAP around or as the dog changes locations, the tab moves with him. This tab will also show the same information setup that you have for the dogs on the screen. If you have name and distance turned on then they will show on the tab. If you have them turned off, then the tab will be blank, but will show the dog's color so you can tell which one it is. Another map view option is the Zoom Map to Dogs feature. When turned on, the unit periodically checks to see if any dogs are off screen on the map. If so, the map will zoom out to a level where all the dogs are visible. You remain centered on the map. This feature will only result in a zoom out. If 'IN' or 'OUT' is pressed, there will be no checks for off-screen dogs for the next minute. If any of the arrow keys is pressed, panning mode is entered and off-screen dog checks are disabled. What's really cool about all these new settings is that you can change them on the fly in the field. All of these settings can be changed from the Map Menu. If you want them, show them. If your screen is getting a little crowded, hide all the options. It's up to you how the screen is set up. If you want dog names, great, activate dog names. If you want distances, activate it. If you want to clear them off, clear them off. You can toggle back and forth between them all. It's flexible, it's easy and very intuitive. I'm pretty excited about that. It really makes the map much more versatile than what we have on the Astro 220. 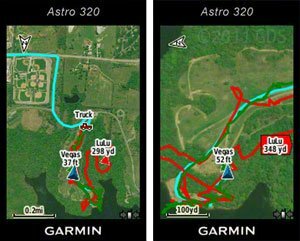 In addition to topo maps, Garmin has added the option for loading highly detailed Birds Eye Satellite Imagery into the Astro 320. By now, most everyone has seen Google Earth, and the Bird's Eye maps are very similar. For $29.99 a year, you can download these aerial images into your Astro 320. Use your BirdsEye Satellite Imagery subscription with BaseCamp software to quickly transfer an unlimited amount of satellite images to your Garmin device and seamlessly integrate those images into your handheld's maps whenever you need them. Transfer an unlimited number of satellite and aerial image segments to your device with this subscription and free software BaseCamp. High-resolution sub-meter color satellite imagery captures the world in brilliant clarity and detail. Allows you to layer the Garmin vector maps on your handheld (such as TOPO 100K, TOPO 24K or City Navigator) with BirdsEye Satellite Imagery for a real-life view of roads, buildings and terrain. Makes it easy for hunters to perform preseason scouting, determine placement of stands and locate game pinchpoints. Helps hikers and campers find trails/trailheads and clearings for camping areas. Lets geocachers determine the terrain type around a cache and identify parking areas close to the caches. Allows travelers to view tourist hot spots and landmarks from an aerial view to make excursions memorable without getting lost. Now that is an interesting idea. I've been experimenting for awhile using my iPhone and Google Maps for satellite images while hunting in places that have roads that are not marked on a map. You can see them from the sky, you just don't have a map. On my iPhone I can see myself and I can see the Google image, but I can't see my dogs. Now, if I want to, I can get the Bird's Eye subscription. This feature is really going to come in useful for folks in large hunting clubs. You will be able to see roads, tree cover, power lines and waterways. You'll also be able to track you dogs on the exact same map. The cool thing is that it's going to show roads that appear from the sky that are not actual roads. It's going to show power lines, tree cover, buildings. The thought of seeing my dogs on a BirdsEye Satellite image is really, really interesting. I have not had a chance to experiment with this yet, but I think Garmin has got a lot of cool things going on here. 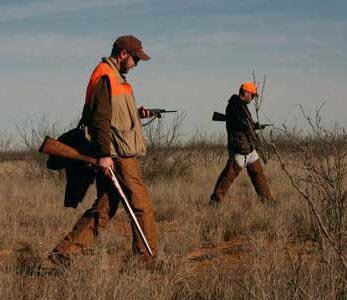 In addition, many state wildlife agencies have started offering free downloadable maps of public hunting areas, so you always know if you’re on legal ground. 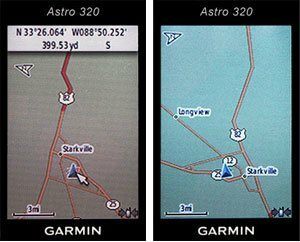 There are also some excellent third party maps that Garmin sells that work on the Astro. With the Astro 320, you can even create your own Custom Maps. Basically, it's a matter of scanning a paper map, georeferencing it, and then loading it into your Astro 320. 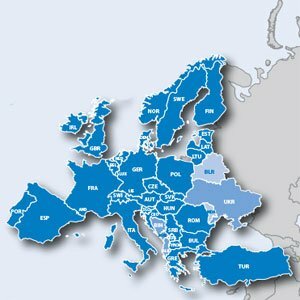 It's the best of both worlds -– putting a trusted paper map inside a GPS unit. Best of all, each map is a different "layer" on the Astro, so you can view each map individually on the display, or together. On the Garmin Astro 320, you can access a few controls using the power button. A quick press of the power button and the info screen shows you Time and Date. It shows the setting for the back light and allows you to increase or lower it. This screen also shows GPS reception for the handheld plus handheld battery life. Another of the advantages on this unit is that you can lock the keys. A quick press of the power button takes you to the info screen. Press the "out" button to lock the key pad. This keeps you from accidentally changing any buttons or settings. To unlock the keypad, a quick press of the power button takes you back to the info screen. Press the "out" button again to unlock the key pad. A new option for Dog Alerts is Vibration. The Astro 320 includes a vibration motor. This allows you to pick from alerts that are tone only, vibration only or both tone and vibration. This can be a handy feature especially in the winter if you are wearing gloves or thick clothes. 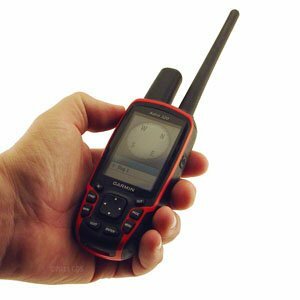 You have the option of having different alerts for point, treed, lost communication and lost GPS signal. Garmin has changed the range listing for this unit from seven miles to nine miles. That is 100% based on a new 13 inch flexible long-range antenna that is included with the unit. Current tests are showing that it will double the range of the standard antenna. 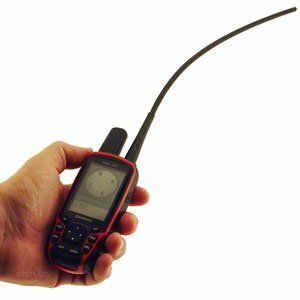 For example, most people in most terrains can get about 1 to 1 1/4 mile from the Astro handheld with the standard 5 inch antenna. This new antenna, which is almost triple the length of the regular, will get double the range in similar situations. If you're getting a mile with the regular antenna, you should get two miles with the new long range antenna. We still have a lot of tests to do for range, and I'm not 100% sure where I stand on it. It's included in the price, so I think it's something that's reasonable and needed. Please note that you are not going to get more range than the 220, you just have another antenna option. We can't get 7 miles out of what we have now. We aren't going to get 9 miles from this unit. The new flex antenna is a little long for me personally to carry for regular use, but I expect some folks will go to it as their normal antenna. The biggest advantage is that it's the only long range antenna on the market that won't break. All the others that we sell have to be handled with extreme caution. This one is super tough. It will take the abuse and keep on tracking. I expect that I'll continue to use the regular antenna unless I get into a situation where I need it. For a lot of the hound guys this will be a nice addition.